PENCIL presented on Building Strong Business and Community Partnerships during the NCAC’s 21st and 22nd Annual Conference. Participants learned how to successfully onboard a business or community partner from intake to placement. Utilizing the PENCIL Partner life cycle model, participants discovered how to build and nurture sustainable partnerships. PENCIL Partnership core competencies provided insight on how to define, recruit, and retain partners. Members from Fayette County Public Schools and Commerce Lexington visited PENCIL for an all-day training session. Clients began the day with a PENCIL 101 session, which covered topics such as building powerful partnerships (recruit, intake, and onboard) and the PENCIL partnership continuum (engage, facilitate, measure, celebrate). During this time clients were able to ask questions and engage in their own learning process. Following this session, the group visited with an Academy Coach and shadowed an authentic partnership meeting. After the initial session, a PENCIL representative traveled to Lexington twice to help on-board the team into the Salesforce CRM platform, which makes it possible to more effectively manage and track Partnership relationships as they move through the continuum. A dynamic collaboration between PENCIL’s representative and the Lexington team allowed for the adaptation of software to manage specific needs. The two sessions allowed the Lexington team to begin tracking partnership interactions as they build intentional relationships in the community. "I truly enjoyed the in-person meetings with potential business partners. It was a great experience to see the conversations happen live and in person." “We are very excited to begin using Salesforce as our team’s primary data collection platform for community and business partnerships within the Academies of Lexington!" Members from Akron Public Schools and the United Way of Summit County visited PENCIL from Akron, OH. Similarly, clients began the day with a PENCIL 101 session, visited with an Academy Coach and later observed an authentic partnership meeting. "I loved seeing actual meetings and job shadowing Bob! The community investment tracking tool was great and I cannot wait to learn more." Members from the Polk County School System along with community leaders attended a PENCIL Lunch and Learn organized by Polk Vision. Building powerful business partnerships was the forefront of the presentation. "The real time scenarios and outcomes heightened the awareness of what is possible and permitted participants to create a new innovative paradigm about industry partnerships with education, schools, and community." Members from Beloit Public Schools and the business community gathered to learn more about building powerful business partnerships within the community. One of the main focus points embraced the concept that Public Education Needs Community Involvement and Leadership and how to accomplish that in the most effective and meaningful way. "I really appreciate PENCIL's clean and clear messaging and love the infographics. The organization is top-notch." 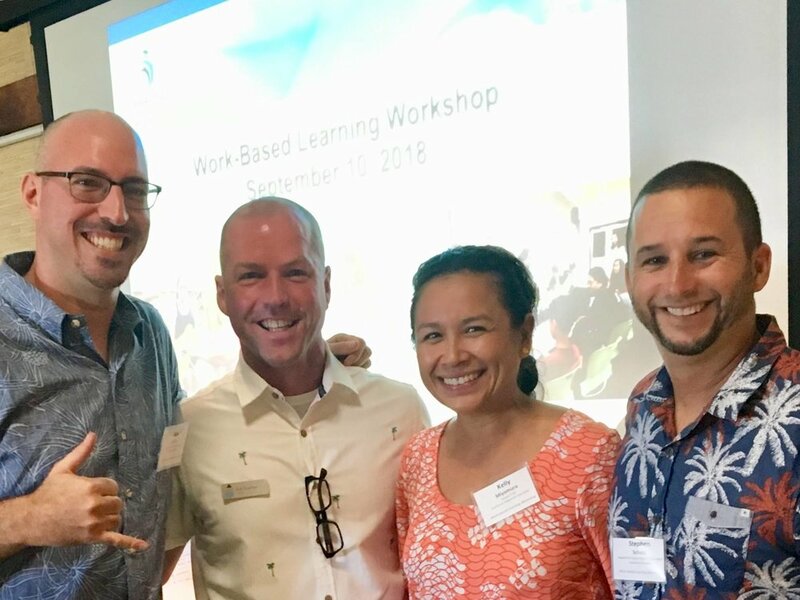 Members from Hawaii State Department of Education, Harold K. L. Castle Foundation, Hawaii P-20 Partnerships for Education, Chamber of Commerce Hawaii and Kaua’i Planning & Action Alliance assembled for a Work-Based Learning Workshop. The organizations collaborated and learned how powerful partnerships can impact the success of students.